When DNA’s answer to the “who do you think you are” question is “not who you thought you were,” the reactions are varied. And journalists write a book. At least that’s what CNBC anchor Bill Griffeth did, after what he thought would be a routine confirmatory DNA test showed something that was far from routine: he was not the biological son of the man he knew as his father. 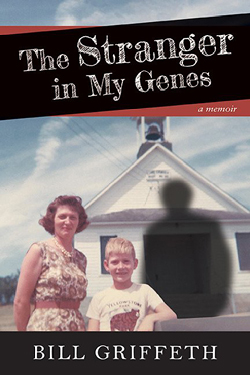 In The Stranger in My Genes: A Memoir,1 Griffeth tells the story of his own unexpected DNA results and the consequences to himself and his family of that discovery. But it’s not the tale that the casual genetic genealogist may expect. The fairy tale version, of course, is the discovery, the hunt for the biological family, the identification of the paternal family, and the happy reunion with that side of the family. What Griffeth tells is the darker side: a searing tale of the emotional toll that can be associated with unexpected DNA results. An avid genealogist who had traced what he thought was his paternal line back many generations, Griffeth took a YDNA test at the request of a cousin, fully expecting it to connect him to generations of Griffeths. To Griffeth, the discovery that the man who’d raised him wasn’t his biological father wasn’t something exciting and interesting. It was painful and devastating. He called it “a deeply unsettling truth”3 that called into question not just his understanding of his father — but of his mother as well. Griffeth’s book is a perfect example of unexpected information — and the emotional punch delivered by that unexpected information. Bill Griffeth, The Stranger in My Genes: A Memoir (Boston: New England Historic Genealogical Society, 2016), 196pp, hard back, $29.95, e-book, $19.99. Thank you for your accurate review of Bill’s book. It is a good read of the hard-to-put-down variety. It is an excellent read — are you the cousin Doug of the book? Thank you so much for bringing this book to my attention. I got the Kindle version and read thru it today – I really couldn’t put it down. Fascinating journey told by an excellent writer.